This guide looks at the Canon 5D Mark IV vs 6D Mark II. They each have full frame CMOS sensors, and they look similar at a glance. 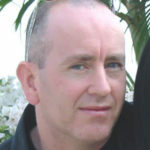 However, there are reasons for the huge price disparities. Both cameras boast a rock-solid build and are a major step up from their predecessors. They also share a bunch of popular features and general appeal. We will look at those further down the page. There are distinct differences between the 5D Mark IV and 6D Mark II, though. Canon aims the lower-priced 6D Mark II at enthusiasts and semi-professional photographers. LCD Screen Size 3.2" 3"
Camera Weight 31.39 oz. 26.98 oz. 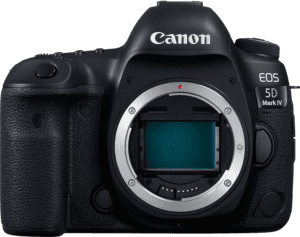 Why Consider the Canon 5D Mark IV over the Canon 6D Mark II? Why Consider the Canon 6D Mark II over the Canon 5D Mark IV? It may surprise you that these cameras share 19 valuable features. That makes them similar—but not the same—in some aspects. OK, let’s look at what they have in common starting with connectivity. Both DSLR cameras have a wireless connection. They also have NFC or Near Field Communication. NFC supports contactless interaction with compatible devices like smartphones. Smartphone remote control can be an invaluable feature for creative photographers. Both bodies have optical viewfinders too. The other visual display options are also impressive. Canon’s 5D Mark IV and 6D Mark II sport large, high-resolution LCD touchscreens. They have top-mounted LCDs as well. Top LCDs make viewing and changing settings much easier in some situations. The external flash shoes provide the potential for more creative flash photography. And for vloggers and DSLR videographers, there are external mic ports for recording higher-quality audio. The CMOS sensors of these cameras produce high resolution images and large detailed prints. The RAW file support gives photographers even more quality control over their photos. Other advantages are Face Detection Focus, fast continuous shooting, and autofocus (AF) fine adjustment. Time-lapse recording and AE bracketing are two more. UHS Memory Card support means higher speeds when reading and writing data. And finally, the environmental sealing helps to protect the cameras when shooting in inclement conditions. There are some differences in the physical specs of these two cameras. From the front view, the Canon 6D MII is noticeably smaller when compared side by side with the Canon 5D MIV. The 6D MII’s smaller size results in a lighter body than the 5D Mark IV. The difference is 4.4 ounces or 125 grams. That’s a significant weight for anyone who wears a camera around their neck all day. Canon 5D Mark IV Width: 5.9” Height: 4.6” Depth: 3” Weight: 31.39 oz. Canon 6D Mark II Width: 5.7” Height: 4.4” Depth: 2.9” Weight: 26.98 oz. The 5D Mark IV’s extra heft is the result of its slightly bigger size and magnesium alloy frame. The 6D MII also uses more plastic in its construction. Only the 6D Mk II has a vari-angle touchscreen. That’s the biggest distinction between the two from a visual perspective. The screen’s left door hinge means all its back buttons are on the right side. There are some familiar controls on the rear of each camera even though the layout differs in places. The 5D Mark IV has a much larger eyecup than the 6D Mk II, so it’s more comfortable to use. The 5D Mark IV has a thumb-control joystick to the top right of its rear LCD. This handy little control gives quick access to various focusing points. A simple press brings the focus back to the center. 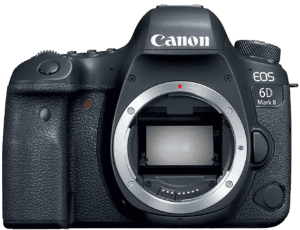 Why Consider the 5D Mark IV over the 6D Mark II? The price difference between these two popular cameras is no small change. The 5D Mark IV has plenty to justify its extra cost, but only if you want or need what it has to offer. It’s 100% viewfinder coverage is more accurate than the 6D Mark II’s 98%. That means the photographer sees a 100% representation of what they’re shooting, nothing more and nothing less. There are differences in the LCD screen size and resolution, too. The 5D Mark IV has a 3.2” display, so it’s 0.2” larger than the 6D Mark II. Its LCD has 1.620k dots, which is a 55% improvement. Both cameras have a high sensor resolution, but the 5D Mark IV is 30MP vs. 26MP (15% more). The external benefits are worth noting, too. A second storage slot is something most folks could use. Canon’s 5D Mark IV has an external flash sync port to connect off-camera flash units. It also has a headphone port to give videographers better control. There’s a 4K photo mode as well (see below). The 4k photo mode lets users extract 8-megapixel stills from 4K video. The 5D Mark IV enjoys higher video resolution at 4096 x 2160 vs. the 6D Mark II’s 1920 x 1080. Color depth is higher at 24.8 vs. 24.4. The 5D’s dynamic range is also higher at 13.6 to the 6D Mark II’s 11.9. The 5D Mark IV also boasts higher ISO performance at 2995 vs. 2862. ISO performance is a major factor for photographers who demand the best possible quality in low light. Shutter speeds vary too. The 5D Mark IV outperforms the 6D Mark II by 1/8000s to 1/4000s. Its 7-frames per second (fps) continuous shooting is slightly faster by 0.5fps. Canon’s 5D Mark IV DSLR has 61 focus points. That gives it a 16-focus point gain over the 6D Mark II. So, there’s a lot on offer with this camera, but is it worth the extra dollars? Keep reading to find out. Why Consider the 6D Mark II over the 5D Mark IV? You may think the Canon 6D Mark II has little to offer after reading the 5D Mark IV advantages. Well, they are two different cameras, but perhaps the 6D Mark II can still meet your expectations. This camera offers photographers a few things the 5D Mark IV doesn’t. Let’s start with its most exciting offering, the built-in digital stabilization (stills and video). That means stabilization for all lenses. It’s a big deal because most of Canon’s camera bodies don’t have in-body stabilization. The brand has a good range of Canon lenses with optical stabilization (OS), but they’re expensive. The articulating screen is another key feature the 6D Mark II has that the 5D Mark IV lacks. The 5D’s fixed LCD is a tad brighter and a little sharper, but that doesn’t make it better or more flexible. Battery life is another advantage of this camera. It provides around 300 more shots on a single charge than the 5D Mark IV. The numbers are 1200 shots to 900 in ideal conditions. Weight matters to photographers who carry cameras around their necks on long shoots. The Canon 6D Mark II body weighs 765g. That’s lighter than the 5D Mark IV 890g by 125g. The final major difference among these much-loved full frame Digital-SLRs is the price. Pro photographers consider the costlier 5D Mark IV an excellent value as a tool of the trade. Enthusiastic amateurs who would like the 5D Mark IV may not find the higher cost as justifiable. The 6D Mark II costs around $1500 less at the time of writing this guide. Canon’s 6D Mark II has a few other advantages going for it as well. It has a max ISO of 40.000. That’s higher by 56%. It also has 45 cross-type focus points, four more than the 5D Mark IV. This camera has a 15% larger sensor pixel area at 33.19µm2 to the 5D Mark IV’s 28.69µm2. Finally, there’s its Bluetooth to connect the camera to other compatible Bluetooth-enabled devices. Neither of these cameras has a built-in flash on purpose. Canon knows that semi-pro and professional photographers prefer to use off-camera accessory flash units. Even so, there are times—especially spontaneous situations—when a built-in popup flash is invaluable. That said, integrated flash is the last resort option due to its harsh, poor-quality light. Neither camera offers focus peaking. Peaking can be a useful feature when using manual focus. Both models lack in-camera panoramas too, though that’s unlikely to be a major buying decision. So, which is better, the EOS 5D Mark IV or the 6D Mark II? Well, it depends on what you want. The 5D Mark IV gets lots of positive feedback from users. Canon first announced it on August 25, 2016, as the successor to the EOS 5D Mark III. Its popularity continues to grow. Reviewers write about the amazing detail produced from the 30MP sensor. They also praise the camera’s dynamic range and its impressive ISO low-light performance. Many users find the WiFi and smartphone control useful. The clear bright touchscreen is another valued feature. However, most photographers would prefer a vari-angle rear display given a choice. Owners of the EOS 5D Mark IV certainly appreciate the weather-sealed body. Most DSLRs still don’t provide sealing. There are a few camera cons, though, despite being a feature-packed product. Some owners complain that the battery life could be better. And those into videography think it should have more shooting options. The camera’s weight also makes recording steady video by hand difficult. The camera’s memory card gets a few objections as it’s slow and outdated compared to Cfast. Canon first announced the EOS 6D Mark II on June 29, 2017, as a successor to the EOS 6D. Those who came from the 5D series appreciate the camera’s smaller size and lighter weight. One of the most noticeable upgrades is the solid feel of the 6D Mark II. And almost all reviewers comment favorably about the fully-articulating rear touchscreen display. Users love the astounding image quality of the 6D Mark II, especially when cropping. The enhanced focusing system is a noticeable improvement too, as is the improved GPS. A few critics say the upgrade is negligible. Most others think it’s a vast improvement in all the key areas. Owners who upgraded from the older 6D tend to be thrilled overall with their new investment. Most progressive photographers agree that the 6D Mark II is an excellent step up. It’s an affordable and feature-packed semi-professional camera, say newbies to this category. There are complaints about the video capability among some. The thing is this: DSLRs are primarily for still photography. A little research on this camera could have prevented these video gripes. Some Canon 6D Mark II owners would like to have seen dual card slots. Overall, the feedback suggests that users are happy in all the crucial areas, especially those new to the full frame format. The Canon 5D Mark IV is a feature-packed and capable camera at the professional end. It has a universal appeal and works well for portraiture, weddings, nature, landscapes, and much more. The 7fps also makes it a good choice for general action and sports photography. It’s easily fast and competitive enough for everyone aside from the dedicated sports photographer. Canon’s 6D Mark II is an excellent choice for those moving up to the full frame format. The camera is also lightweight and affordable. It gives photographers most of what they need and nothing they don’t. I have read many articles about this and my head is telling me to go for the 5d, it’s just my wallet that disagrees!